Hand Signals while riding with traffic will help prevent an accident between yourself and the other vehicles on the road. Have your adult partner draw a Food Guide Pyramid on a big piece of paper or posterboard. Cut out pictures of food from old magazines and glue them in the right places on the pyramid. You could also draw pictures of different foods on your Food Guide Pyramid. You could display your Food Guide Pyramid at the next pack meeting. 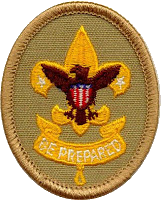 When you have colored all three of the tiger tracks in the back of your Tiger Cub Handbook (pg 161), you will have earned your Tiger Cub Immediate Recognition Emblem. Once your Cub Scout earns the Totem, he should then proceed to complete the other requirements for the Bobcat Badge. 1F: Think of one chore you can do with your adult partner. Complete it together. Take a second and think of a few of the chores around your house.... The following are some around my house. We can lighten the load of work when each member of the family helps out with the chores around the house. The same is in your Dens and Packs. When each scout does his duty, it helps the pack go.